Framed by critical globalisation theory and David Harvey’s ‘co-revolutionary moments’ as a theory of social change, this book brings together a multi-disciplinary team of researchers to empirically analyse how socialism is being constructed in contemporary Latin America and the Caribbean, and beyond. 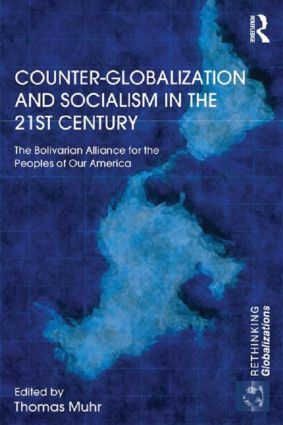 This book uses the case of the Bolivarian Alliance for the Peoples of Our America - Peoples’ Trade Agreement (ALBA-TCP) to invite to a re-thinking of resistance to global capitalism and the construction of socialism in the 21st century. Including detailed theory-based ethnographic case studies from Bolivia, Cuba, El Salvador, Nicaragua, Venezuela and the USA, the contributors identify social and structural forces at different levels and scales to illuminate politics and practices at work. Centred around the themes of democracy and justice, and the more general reconfiguration of the state-society relations and power geometries at the local, national, regional and global scales, ALBA and Counter-Globalization is at the forefront in the trend of interdisciplinary approaches to the study of social phenomena of global relevance. Counter-Globalization and Socialism in the 21st Century will be of interest to students and scholars of Latin American politics, global governance, global regionalisms and rising powers. "Counter-Globalization and Socialism in the 21st Century is ground breaking in conceptualization and theoretical approach. Innovative and dynamic, it is just what is needed to stimulate thought on what 21st century socialism is or could be and how it might be achieved. The careful linkage of new forms of regional relations that became symbolized in the Venezuelan led Bolivarian Alliance for Peoples of Our America (ALBA) to domestic politics and productive relations, social movements and greater citizen participation is fascinating and precisely the type of linked analysis that is so necessary to understand anti-hegemonic counter globalization struggles in Latin America and throughout a post neoliberal world." - Professor Harry E. Vanden, University of South Florida, USA. "At times of crisis, discussions of fundamental alternatives, like those presented here, become particularly important – read them!" - Professor Richard Peet, Clark University, USA. Thomas Muhr is a Visiting Fellow in Global Development at the University of Bristol, UK, and Visiting Professor at Johannes Kepler University in Linz, Austria.